"Beat your plowshares into swords, and your pruning hooks into spears; let the weak say, I am strong" (Joel 3:10). Note the prophecy has two parts. First there is an explosive growth in weapons; second, this growth allows the weak to become strong. Today's incredible arms trade involving the weaker Third World countries matches the condition described by Joel almost exactly. The worldwide arms trade has indeed been explosive. Worldwide arms exports zoomed 60 percent in the decade 1966-76, and took off at a 28 percent per year clip in the last half of the 1970s. More than $20 billion of arms are traded worldwide. The official figures may even be on the low side because some of the arms trade is hidden in civilian export statistics. Besides the great quantity of weapons now traded worldwide, quality is up also. Middle Eastern countries are buying the very latest weapons — and now are actually financing the research and development of those weapons. In one recent deal, France sold certain missiles before they were even available to its own navy! But if the two superpowers dominate the market, the Western and Central European countries are aggressively pushing their own export programs. French arms exports, for example, more than quadrupled in the period 1968 to 1977. And who buys? In a word, many countries that can't afford it. Third World countries buy about four fifths of all arms traded in world commerce — the same countries, which, according to a U.N. report, spend six times more on arms than they do on public health. While it seems every country in the world is rapidly acquiring weapons better than those used by the superpowers even a few years ago, efforts to stop the trend seem futile. 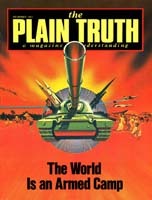 During the Carter administration, the United States made, a strong effort to cut down world arms trade by restricting sales to nations with allegedly poor human rights records. It didn't work. Those nations turned elsewhere — the Soviet Union, Europe, even Israel. The policy didn't even cut the flow of U.S. arms exports! A few years after President Carter had announced his desire to curb the world arms trade, his administration witnessed near record levels (only the halt of U.S. arms to Iran after the revolution there prevented new records). A typical pattern finds Western Europe stepping in when the United States tries to halt the flow of its arms. Thus, in the years after World War II, when the United States refused to let Latin American governments buy jet fighters, European producers were willing. When the Soviet Union refused to sell Egypt better quality arms, Europe likewise filled the demand. The world's major arms sellers are simply on a treadmill which they can't get off. France and Britain must export arms just to keep their own defense establishments in business, a pattern that also applies to countries such as Israel and Brazil. In West Germany, some 200,000 workers are dependent on the arms industry for their jobs. Israeli arms exports contribute a great deal to the country's earnings, without which its inflation-ridden economy might go under. Likewise, the Soviet Union's foreign sales bring in about an eighth of that country's hard-currency income. Obviously, as long as one arms exporter is willing to meet the demand, hopes for any slowing of the flow of the world arms are dim. Moreover, there is no hope in sight — at least in this world — that the unquenchable thirst for arms in the Third World will abate. Practically all wars since World War II have involved Third World countries. These are the nations, perhaps for reasons of both security and pride, who have the greatest need for conventional weapons. Thus, the arms trade remains costliest to those who can least afford it. The world spends roughly 60 times as much equipping each soldier today as it does educating each child. Often the cost of arms to poorer countries far exceeds what they receive in civilian foreign aid from the selling countries. Interestingly, the countries since World War II that have spent relatively smaller amounts on the military (Japan and West Germany are the two readiest examples) are the countries that enjoy the most economic growth. Globally, the world has gotten itself in an absolute bind. The need for security, and a recognition that the other fellow's human nature may lead him to desire your territory, demand heavy arms outlays — even by small countries. As Senegal's President Leopold Senghor states, "The need for security is a major point of national awareness in all African states." In all human states, in reality. In the World Tomorrow, which we announce in the pages of this magazine, security will not be a concern of nations. Jesus, the Messiah, governing from Jerusalem, will guarantee the peace, by supernatural means. Today's costly trade in arms will be totally banished. "Neither shall they learn war any more" (Isa. 2:4).